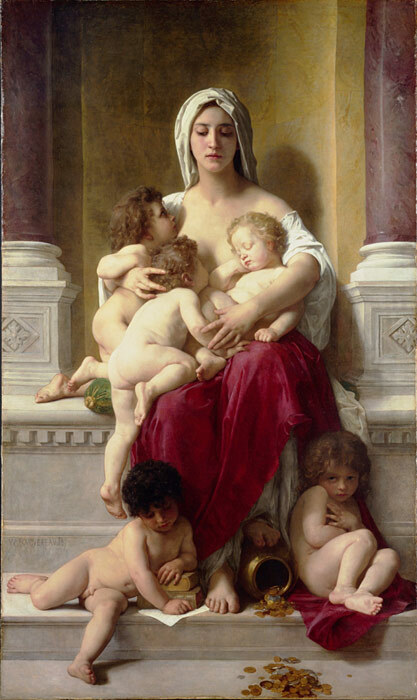 In its most extreme form charity can be self-sacrificial.But in this painting of Bouguereau charity is often translated "love" to avoid confusion with almsgiving. However, confusion can arise from the multiple meanings of "love" not all of which indicate the supernatural virtue. The Charity in this painting is distinguished by its origin, being Divinely infused into the soul, and by its residing in the will rather than the emotions, regardless of what emotions it stirs up. Supernatural charity is necessary for salvation, and with it no one can be lost. SPECIAL NOTE : The painter will make the reproduction as close to the original oil painting as possible. If you want your painting to alter from this likeness, please email us and " La Charite [Charity], 1878 " will be reproduced according to your special requirements.